Why Avail of Luggage-Free Travel? Japan ranks as the world’s 63rd largest country sandwiched in-between Norway (62) & Germany (64). Slightly smaller than the state of California what really makes Japan stand out is how long it is. Stretching over 3,000 kms from the Sea of Okhotsk to the Philippine Sea it’s long. While your travel plans may not include a trip to Japan’s extremities it will involve long-distance movement. If you’re planning on using Tokyo’s public transport at peak times you might want to consider what to do with your luggage. That’s where Luggage-Free Travel comes in. 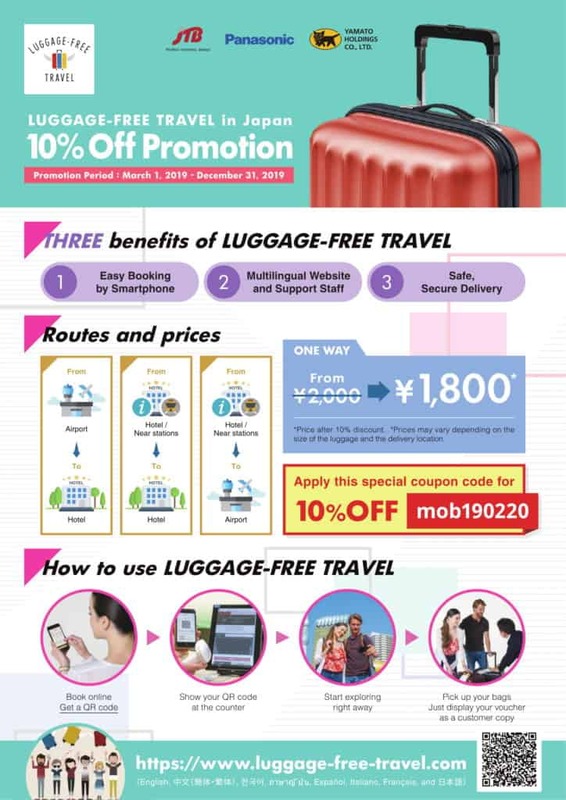 Luggage-Free Travel allows you to travel Japan luggage-free by offering a simple web-based service that can be easily accessed on your smartphone. Once you’ve booked you get a QR code to show on arrival in Japan- and whoosh- your luggage goes where you want it to go. And you get to freely go wherever you want to go. Simply click here to find out more or watch the rather entertaining video below!